I have been a friend of Benny's for years and have benefitted several times from his generosity and willingness to help. 11 years ago my husband and best friend Denny O'Connell passed away of cancer. It was just 10 days after the completion of his dream of finishing our second Eagle together. I found myself with a pair of Eagles to take care of on my own. One of the first things Benny did was to send me 2 pair of his rudder cable shortners which he would not let me pay a dime for. Recently, I had an unfortunate incident where one of the chains attached to the spring of the steering arm of Denny's Eagle came loose on landing. As a result, I ended up needing to replace the fabric on my lower left wing. I called Benny and was relieved to hear he was willing and able to help. He asked me to send the damaged wing down to Iowa from MSP so he could duplicate Denny's award winning work and had my wing ready to paint in record time. I was sick to have damage to Denny's plane and did not want to try to put the wing back together on my own. Benny has truly been a godsend. He not only does magnificent fabric work, but he made sure it was done the way Denny would have done it if he were here. There is no one I would trust to do this work, and if it weren't for Benny, I would still be rib stitching! I just wanted to share this story with you and let you know, in my book, there aren't many guys out there like Benny. There are none that know the Eagle as well as he does. He has been such a great source of support for so many of Eagle builders. His work is legendary, and his friendship is priceless. I recently had the pleasure of working with Benny Davis of Davis Aero Parts. 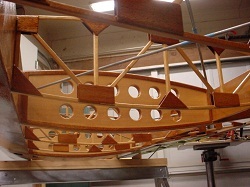 I am in the process of building a Christen Eagle II. I am about 2/3rds done and at the point where the wings get attached to the fuselage. This requires a Rigging Kit followed by the Fairings Kit. Through information on the Eagle Interchange - I was aware that Davis Aero Parts was currently producing these two kits with a substantial cost savings over the kits from Aviat Aircraft. So I contacted Benny, introduced myself and discussed my Eagle project. From the first moment it was great to work with Benny. He has a wealth of knowledge on the Eagle and takes a real interest in your project. He truly wants to help you and offers lots of good ideas on the build. Benny said that he could furnish complete kits for the Rigging and Fairings Kits. I said that I would definitely get a Rigging Kit and Fairings Kit and that was all that was needed to start the process. The service was outstanding ! Benny started on the kits right away. There was no deposit , full payment, or other information needed - only a phone number and an e-mail address if he had questions and to keep you updated. You see - Benny is "old school" where your word is all he needs and in return he will provide great service and help in anyway he can - truly refreshing in this day and age ! Well - it wasn't long and Benny said the kits should ship within the week. The kits arrived in a few well packaged boxes and crates. I was eager to see the quality of the parts and construction. The kits / parts looked very nice. Based on one of our discussions Benny had made the wheel pants out of carbon fiber which were very well constructed and at a big weight savings over similar fiberglass parts. I inventoried all of the parts which were well labeled and actually matched the instruction manuals. I do have to say that there were a few parts missing - but a quick e-mail with the part numbers and the missing parts arrived in a few days. No questions asked - just great service ! Benny even provided some additional parts that we had talked about - at no charge. Benny continued to followed up with an e-mail or two on working with some of the specific parts. So this weekend I start working on the Rigging Kit and getting the wings attached to the fuselage - I am excited because it is going to look pretty cool ! Working with Benny / Davis Aero Parts was a very pleasurable experience because of the service and quality of the kits. The only thing that needs to change is that Benny should produce all of the kits for the Eagle - that would be nice !